Nintendo of America has embraced the Nickelodeon Kids' Choice Awards in recent years, and with good reason - it's given valuable opportunities to promote games like Mario Party 10 and Splatoon, targeting a key demographic for the company. Nintendo is now listed as a core sponsor for this year's event, which is on 11th March, and that's likely to be a chance to promote the Nintendo Switch, in particular. Alongside Nintendo other sponsors will include Cinnamon Toast Crunch, Hot Wheels, Skechers, Toyota and Walmart; evidently Toyota hopes plenty of parents will also be watching. 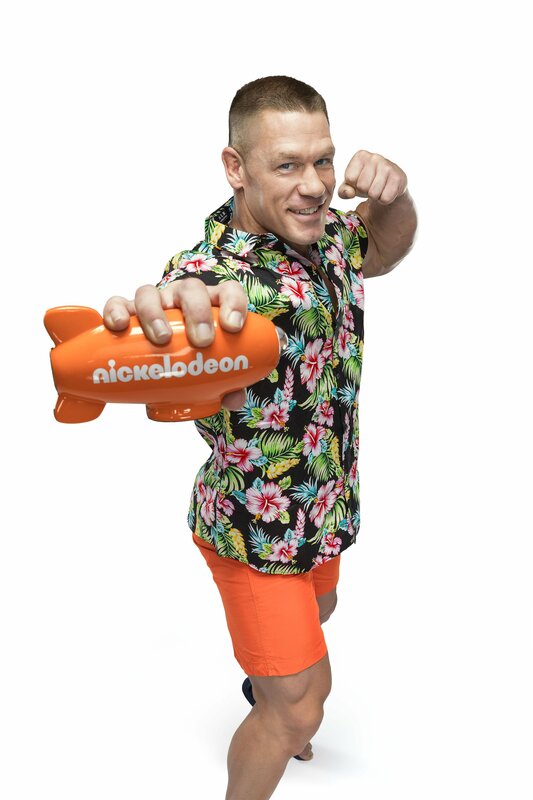 The host this year is John Cena; you can see his promo shot below, including uncomfortably tight orange shorts - there's also a statement by his marketing team posing as him in the press release. Nickelodeon's Kids' Choice Awards is the biggest party for kids, and I'm so excited and honored to host this year's show. "I have a lot of big surprises in store so bring on the slime! - John Cena / John Cena's personal assistant. This could certainly be a great chance for Nintendo promote the launch of Switch (it'll have come out eight days before the show) and upcoming games to a large audience. Obvious candidates for marketing could be Mario Kart 8 Deluxe or Splatoon 2, so it'll be interesting to see how Nintendo gets involved. If you Smell.... what is John Cena doing at Nickelodeon's 2017 Kids' Choice Award ? Maybe they can talk to Cena about getting us a proper wrestling game on a Nintendo system. Those were staples of the SNES, 64, and GC eras. What needs to happen is just as Nintendo have been given an award, Living Colour's 'Cult of Personality' starts playing and SEGA comes out holding an identical version of that award. I think you stumbled across an Onion article, NL. This is the kind of thing. Intense should have been doing for years. If they would have taken the same approach to marketing, we may still be playing the Wii U for at least another year. What tight orange shorts? I don't see anything. @Dakt only of its TNA AJ. He's been watered down so much in WWE, while Cena is sometimes allowed to be funny, and sometimes he can be very funny. The John Cena meme - headphone users beware! - came in a wide array of variations, but my favourite so far has been Cena hijacking an iconic turning point in the first Kingdom Hearts game's storyline. That's it Nintendo, get all the kids excited to buy a Switch, and then only ship a small amount. This is Nintendo's system for creating a demand. I'm about done with Nintendo. I love the games but hate the tactics. Yeah, I saw this watching Smackdown last night. I was wondering what this had to do with Nintendo before reading the article. It's been years since I watched Nickeloden. I have watched Spongebob on Hulu ever now and then though. I can't remember life before JOHN CENA!! Great marketing though, Nick and Cena, nice. Any word on Switch getting a Superbowl commercial? You can't be serious about marketing new hardware 4 weeks after the Superbowl w/o a Superbowl commercial. It doesn' tevenhave to e during he game, pre-game is fine. And before anybody complains about the Superbowl cost and what a waste of money it is, thing is, even if nobody sees it during the game b/c they're in the bathroom or something, any commercial that airs during the Superbowl will be talked about for days and watched over and over on Youtube. You aren't paying millions of $ for 30 seconds, you're paying it for a weeks worth of coverage. I woudlnt ever expect a SB commercial for 3DS or the ever slowly dieing Wii U, but 1 month before launch is almost perfect timing. Cena is totally an Xbox man. Thought Nintendo did a superbowl add last year regarding pokemon? He's going to punch us in the face...with a smile! Anyway, sounds like a good idea for Nintendo. Let's hope they don't squander it by focusing on the wrong things. @Arnold-Kage Ooh, good point about last years commercial. Just went back and rewatched that commercial and maybe Nintendo shouldn't do one this year. OK, it wasn't that bad, but its a 1:10 commercial and if you watched the first 42 seconds you wouldn't know what it was about. 9 out of 10 people would probably guess Nike or "sneakers". And even the rest of the commercial doesn't show any videogames. Pokemon has the trading card game, a long running TV series, yearly movies, clothes, pjs, and video games. They didn't even mention Pokken Tournament in that ad. So I do stand corrected, but I hope this year if they do a Switch commercial, which they should, they actually show the Switch and some videogame footage, not people exercising. Those shorts do look uncomfortably tight. I want Matt and Jeff Hardy to do an ad for Breath of the Wild during this in their new personas. I don't understand Americans and the whole slime thing. It's simply disgusting. I guess they enjoy seeing other people suffering? I think G-boy beat you to the punch with his clip. No problem also does it not cost a lot of money to have an add aired during the superbowl? I thought this was about John Cena but the picture is just a nickelodeon blimp? Am I missing something? I doubt slime causes any actual suffering. I know it doesn't hurt or anything like that, but it's gross. Very cool guy. He's done over 500 Make-A-Wish requests. @RodSD64 it's just green water and starch I believe. is he going to promote the sequel, Animal Crossing: Amiibo Festival 2? or Grand Dad for Nintendo Switch? He got a funny name. "Cena" in czech means "Price", hehe. @cheonsacz As well as in Slovenian and Serbian. As smart of a move as this is for Nintendo, I doubt it's for the Switch. It's most likely for the 3DS, which Nintendo is keeping around as a cheaper option for kids. The Switch seems like it's marketed to 18-34 year old casual gamers. I'm laughing far harder than I should. Thankfully I'm in a place I mentioned earlier today. will they hint something out for the Nintendo cartoon coming to nickelodeon?